These are for handing out as a promotional item only. These are not designed to be resold. One of our most cost-effective items, our bulk labeled condoms are a very popular give-a-way. 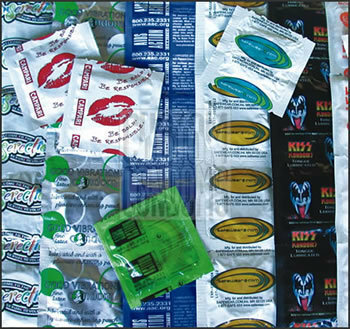 Clear or white custom labels are applied to these brightly colored condoms. They come in six shades: red, blue, green, yellow, purple and black. For pricing with CLEAR packages, click here.